At the beginning of this week, on January 8, 2018, the U.S. Supreme Court released its first opinion of the new year. 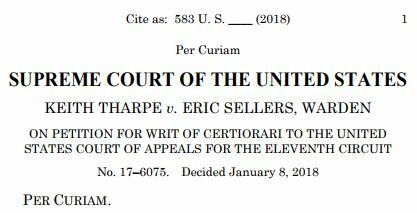 The decision in Tharpe v. Sellers, consists of a three-page per curiam, followed by a thirteen-page dissent written by Justice Thomas, joined by Justices Alito and Gorsuch. As posted at the Court’s web site readers are, perversely, invited to cite Tharpe as “583 U.S. ___ (2018)”. In the form presented the citation is of little use. Only future decisions of the Court itself would dare to employ such an incomplete reference, at least without adding a parallel citation to facilitate precise retrieval. The Court’s practice is to leave that task to others. The Thomas dissent in Tharpe cites two 2017 decisions simply as: “Buck v. Davis, 580 U. S. ___ (2017) and Pena-Rodriguez v. Colorado, 580 U. S. ___ (2017)”. This approach forces his jump cite for a passage in the latter to read: “580 U. S., at ___ (slip op., at 17)”. Bloomberg Law, Lexis, and Westlaw have already augmented all such useless references with complete parallel cites to one or more unofficial reports. By now both the legislative and executive branches of the federal government have embraced digital publication in ways that provide researchers with citable versions of the United States Code and the Code of Federal Regulations far more up-to-date than print ever allowed. They lag official action by days not years. Yet the judiciary, led by the Supreme Court, remains stuck in a print-dependent approach to publication and citation. The demand for print law reports has, of course, plummeted. At the same time federal budgets have grown tighter. The result? Growing delays. The two earlier posts detail the costs imposed on others by these delays, as well as specific steps the Court could take to remove them from its publication process. As 2018 gets underway, the only observation to make is that the problem has not diminished, and the Supreme Court appears oblivious to it.